Well, obvuously, I haven't posted in along time. There are many reasons for this but I won't go into much of it. One big reason is I was having a MAJOR spam problem. I shut down my comments for about a month and am going to open it back up now and see how it goes. There has been some knitting! 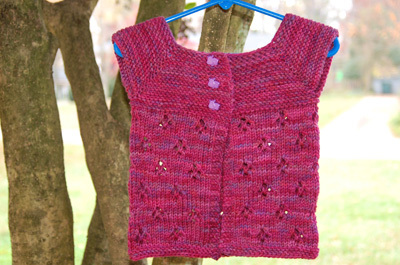 I started and finished Boheme for a very sweet new baby girl named Harper. I love it when talented knitters share their patterns with the public because they certainly don't have to! This is super cute over a long-sleeved onesie with jeans or short sleeves if it's warmer. I made the mod of a garter edge on either side of the sweater to prevent rolling and garter at the bottom (the pattern calls for a picot edge). If I were to make this again, I would put the buttons closer to the edge of the sweater. I found very cute hippo buttons for this project that upped the cute factor! This was a great less-than-one-skein project. I used some Dream in Color Classy that I had sitting in my stash - perfect! Very cute! Love the hippo buttons. This page contains a single entry from the blog posted on November 29, 2009 9:02 AM. The previous post in this blog was Friday Foto - Week 4. The next post in this blog is More Monkeys.